We’re returning to London for a one-off night at Village Underground this Saturday, inviting some of our favorite Londoners to perform alongside the Mixpak team of Dre Skull, Jubilee, and The Large. Joining us will be rapper Sneakbo, fresh off his debut LP Brixton, dancehall MC Lisa Mercedez, and NTS all-star Martelo, as well as Killa P holding it down on mic duties throughout the night. Some special guests might be in the cards as well – but you’ll have to show up to find out. We’re so excited to get back to London- it’s going to be a special one. Make sure to grab advance tickets here so you don’t miss out. We’re taking over Reprezent Radio on Monday in advance of our party at Village Underground on Saturday! From 7-9 UK time (2-4 EST) Mixpak family Jubilee and The Large will be taking you through alongside special guests Lisa Mercedez and Martelo. Expect exclusive tracks, remixes, and much more. Tickets to our Village Underground takeover with Sneakbo, Lisa Mercedez, Jubilee, Dre Skull, Martelo, and The Large are still available – make sure you cop for guaranteed entry! We’re curating and playing a month-long residency at Williamsburg’s Black Flamingo, showcasing dancehall, afropop, reggaeton, modern club, and more. Our first, on March 1, features two genre-hopping favorites: London’s Amy Becker and a DJ set from singer-songwriter Embaci. On March 8 we’re flying in reggaeton pioneer DJ Playero all the way from Puerto Rico, and Riobamba will be repping the NYC latinx club sound. March 15 we’ll be blasting off to the outer limits of the club with Mixpak family Palmistry and Jubilee, as well as London experimentalist Organ Tapes. NYC dancehall don Bobby Konders of Massive B will be in the building on the 22nd, as well as partystarter Mistervacation. And finally on March 29 we’ll be bringing back DJ Tunez after he brought down the house in our December party, with Jubilee and our friend Uproot Andy supporting. Dre Skull and The Large will be holding it down on residency duties every night as well! All of these are FREE with RSVP at rsvp:mixpakrecords.com. 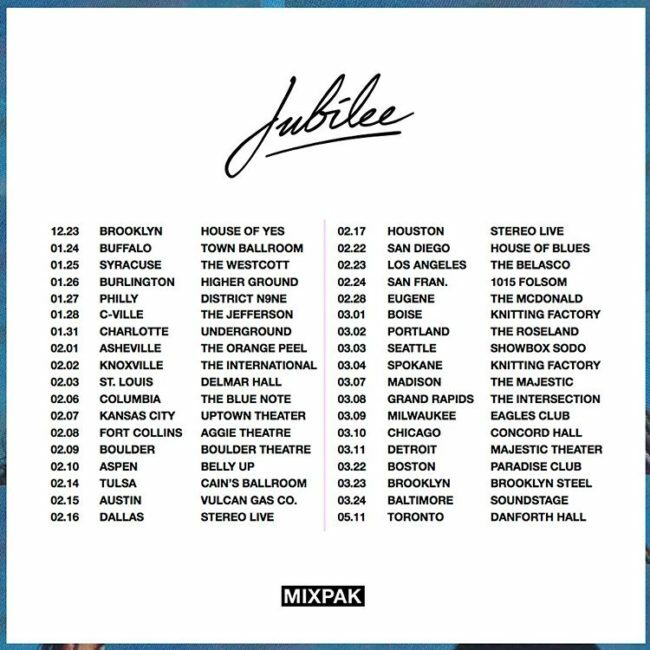 Jubilee headed out on a massive American tour supporting Keys N Krates this week, planning to stop at a range of venues and festivals in over 35 cities. It’s her first time in many of these cities, so go out and show her some love. Click the image below for tickets and check out her video for “Wine Up” here. Jubilee is beginning her stint as a resident on BBC Radio 1 tonight at 7 EST/12 GMT! She’ll be playing tracks from Dre Skull, Questionmarc, Nightwave, and many more in one of her signature genre-spanning DJ sets. You can tune in here!